I Do One Two Three held his own in some of the nation's biggest paint races to earn the APHA's highest racing honor. Michigan-bred I Do One Two Three capped off a successful 2010 campaign by earning the American Paint Horse Association’s Running World Champion title for Regular Registry Paint Quarter Horses. The announcement was made Jan. 15 at the Heritage Place Sale in Oklahoma City, Okla. The tobiano four-year-old Judy’s Lineage gelding is homebred by Mount Pleasant Meadows president Walter and Carolyn Bay’s T-Bill Stables. A pair of trainers, Sleepy Gilbreath and Kasey Willis, sent I Do One Two Three to the post in 2010. A winner of two of his seven starts in 2010, I Do One Two Three finished the year with earnings of $32,627. His overall career record boasts four wins from 14 starts for earnings of $74,375. I Do One Two Three also earned divisional honors as top three-year-old gelding and overall champion three-year-old on the Regular Registry side of the awards. In 2009, he took home the award as the APHA’s top Regular Registry two-year-old gelding. The APHA honors divisional champions in two separate registries – Regular and Solid Paint-Bred. According to the APHA, to qualify for the Regular Registry, as I Do One Two Three does, a horse must “exhibit a minimum amount of white hair over pink skin.” Solid Paint-Breds comparatively show very little color. In the press release announcing the winners, the APHA describes its criteria for selecting champions as based on “level of competition, location, races won and earnings for the year”. I Do One Two Three kicked off his 2010 campaign with a convincing win in his trial heat for the Graham Paint & Appaloosa Derby (G1) at Remington Park. A rough break, though, led him to a fourth place finish in the final. He finished fourth again in the Paint Stallion Breeders Association Derby (G1), also at Remington. After a fifth place finish in the Texas Paint Horse Breeders Association Derby (G3) at Sam Houston Race Park, I Do One Two Three returned to Oklahoma to win the Lorelei Derby (G3) at Will Rogers Downs. He closed out the year at Will Rogers with a runner-up finish in the Talimena Handicap. I Do One Two Three did not race in Michigan last year, but he does have experience at Mount Pleasant Meadows from his two-year-old season. 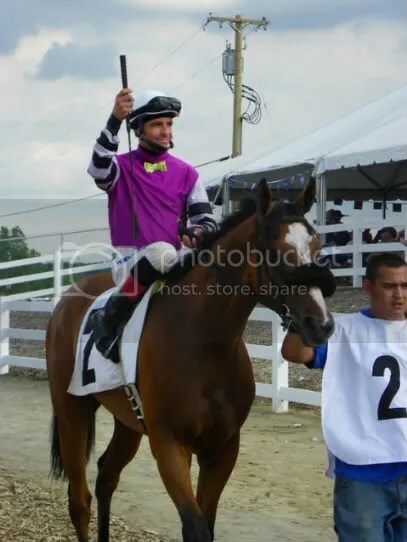 In 2009, I Do One Two Three registered a trial win and a pair of second place finishes in the Great Lakes Quarter Horse Association Michigan Paint Horse Futurity (G3) and the GLQHA Stallion Service Sale Futurity. The APHA’s inaugural Canadian champion, Paint Me A Bono, also has some experience at the central Michigan mixed breed track. The four-year-old Bono Jazz gelding outkicked I Do One Two Three to win the 2009 GLQHA Michigan Paint Horse Futurity. He preceded that with a maiden-breaking score in his only other start at Mount Pleasant. Bred in California by Theresa and Alan Reese, Paint Me A Bono is owned by Ivy Lane Racing and trained by Michigan-based conditioner Tom Dunlap. Paint Me A Bono went one for seven in 2010, but he finished in the money in five of those starts. His earnings for the year totaled $24,972. The gelding’s year started at Remington Park, with the trials and finals of the Graham Paint & Appaloosa Derby. He finished third in both races. Paint Me A Bono then moved north of the border, where he competed in the allowance ranks at Ajax Downs. To view the full APHA press release, along with pictures of the champions and a list of other divisional winners, click here. I Do One Two Three competed in stakes races at Remington Park and Mount Pleasant Meadows during his award-winning 2009 campaign. Michigan-bred I Do One Two Three was named champion regular registry two-year-old gelding at the Jan. 16 American Paint Horse Association’s Running World Championships. The Judys Lineage gelding is owned and bred by Walt and Carolyn Bay’s T-Bill Stables. While in Michigan, he was trained by Jay Hall and ridden by Julie Veltman and Oscar Delgado. I Do One Two Three won two races from seven starts during his two-year-old campaign with earnings of $41,748. In 2009, he entered the gates at Remington Park, Mt. Pleasant and Blue Ribbon Downs. I Do One Two Three competed in stakes races or trials at all three tracks he visited. On May 30, He finished fourth in the $273,987 Graham Paint & Appaloosa Futurity (G1) at Remington Park. At Mt. Pleasant, I Do One Two Three finished second in the Aug. 30 Great Lakes Quarter Horse Association Michigan Paint Horse Futurity and the July 26 GLQHA Stallion Service Sale Futurity. I Do One Two Three also registered the fastest time in the trials of the latter race. To view the full list of winners from the 2009 APHA Running World Championships, click here. I Do One Two Three leads a talented field of colorful juveniles in Sunday's Michigan Paint Horse Futurity at Mount Pleasant Meadows. Four stakes races from different breeds highlight Sunday’s race card at Mount Pleasant Meadows. 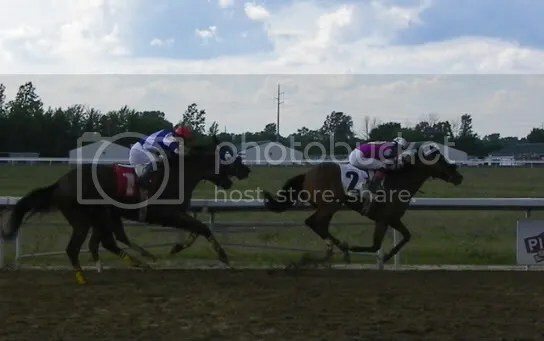 This post will focus on the two Paint and Quarter Horse races, while the next will preview the two Arabian stakes on the card. After a second place finish in the July 26 GLQHA Stallion Service Sale Futurity, I Do One Two Three will try for his first stakes win against his spotted counterparts in Sunday’s $18,000 GLQHA Michigan Paint Horse Futurity at Mount Pleasant Meadows. I Do One Two Three has had a productive tenure at Mount Pleasant after spending the spring at Retama Park. The two-year-old Judys Lineage gelding took the runner-up spot by a half length in the Stallion Service Sale Futurity after registering the fastest time during the race’s trials. Oscar Delgado will ride I Do One Two Three for owner T Bill Stables and trainer Jay Hall. Owned and trained by Dave Gates (and co-owned by his wife, Shirley), See Me In Your Dreams enters the Michigan Paint Horse Futurity off two straight victories. The Awesome Chrome filly’s most recent win came in an Aug. 2 speed index race at Mount Pleasant, where she prevailed by 1 1/2 lengths. Lee Gates will be aboard See Me In Your Dreams this Sunday. Also entered is maiden winner Paint Me a Bono. The Bono Jazz gelding is a perfect one-for-one, following a late-running victory by a head in a June 14 maiden race at Mount Pleasant. Richard Rettele will retain the mount for owner and trainer Renee Wilson. Im The Saint will be the lone male sent from the gates in Sunday's Stallion Service Sale Derby at Mount Pleasant Meadows. When looking at the field for Sunday’s $15,000 GLQHA Stallion Service Sale Derby at Mount Pleasant Meadows, Im The Saint stands out. The Saint Shining gelding is the only male scheduled to enter the gates in Sunday’s race. Perhaps more importantly, Im The Saint is the field’s lone stakes winner, with a win in last year’s Stallion Service Sale Futurity at Mount Pleasant. Im The Saint enters Sunday’s race off a third place finish in a trial race for the Stallion Service Auction Derby at Hoosier Park. He is trained by Ron Raper for owner Debra Redmond. Harold Collins will have the assignment. Also entered is Carol Rettele trainee Anniversary Annie. The First Wrangler filly comes off a fourth place effort in an Aug. 2 speed index race at Mount Pleasant. Anniversary Annie is owned by Mark Mercer and will be ridden by Richard Rettele. 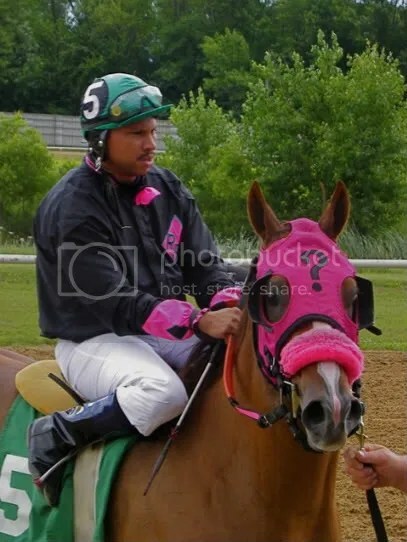 Joni B Special highlights a three horse entry owned by R and R Racing Stable LLC. The Special Effort filly makes her first start in Michigan this year after finishing second by a neck in a July 18 allowance race at The Red Mile. She is trained by Tony Cunningham and Oscar Delgado will be aboard. Meadow Wise (2x) drives to the wire to win the Dowling Stakes at Pinnacle Race Course. After getting close in several stakes attempts but always coming up short, Meadow Wise finally earned a blacktype win in Saturday’s $20,000 Dowling Stakes at Pinnacle Race Course. The three-year-old Meadow Prayer gelding took a wide path from the outside post in the early goings and sat in fifth as I Found Friday and Juggle pressed for the lead. Meadow Wise began his move near the end of the backstretch and had Juggle within his sights as the two entered the final straightaway. The stablemates did battle throughout the final two furlongs, with Meadow Wise drawing even in the middle of the stretch. He gained the advantage in the final hundred feet and pulled away to win the race by 1 1/4 lengths in a driving finish under jockey Angel Stanley. A late-closing Romeo Again nosed out Juggle for second. Meadow Wise covered the one mile distance in 1:41.68 over a fast track. He was part of a three-horse entry sent off as the 1.80-to-one favorite. Meadow Wise is owned by Mast Thoroughbreds, LLC and trained by Robert Gorham. He was bred in Michigan by James Arnold, Marcia Arnold and Deborah Miley. The Dowling was Meadow Wise’s second career victory from 10 starts, coming off a maiden triumph in his last effort. With the win, Meadow Wise increased his career earnings to $58,126. Your winner, Meadow Wise; Angel Stanley, up. Happenedindamoonlite (5) crosses the line ahead of I Do One Two Three (1) to win the GLQHA Stallion Service Sale Futurity at Mount Pleasant Meadows. Perhaps it was an omen that the saddlecloths in Sunday’s $36,483 GLQHA Stallion Service Sale Futurity were all green, the color commonly associated with the number five horse. Whatever it was, it did not cause any confusion when the race’s five horse, Happenedindamoonlite, pulled off the upset at odds of 11.10-to-one. The two-year-old Jewels First Moon gelding broke well and established a small lead over the tightly-bunched pack heading into main stretch. Happenedindamoonlite and post time favorite I Do One Two Three gained a length’s separation from the field, but the leader never yielded and powered ahead to a half length victory under jockey Harold Collins. I Do One Two Three finished a half length ahead of late-moving Kit Corona for third. Happenedindamoonlite stopped the clock in the 350 yard race at 17.840 seconds over a fast track. Happenedindamoonlite is owned by Jack Geer and is trained by Ron Raper. He was bred in Michigan by First Moon Farms. The Stallion Service Sale Futurity victory was the gelding’s second win in four starts and increased his lifetime earnings to $22,401. Your winner, Happenedindamoonlite; Harold Collins, up. Mr. Conclusive, last year's champion two-year-old male, will look to keep his undefeated streak alive this Saturday. A deflated purse did not scare the entries off, as an overflow field was drawn for Saturday’s $20,000 Dowling Stakes at Pinnacle Race Course. The one mile race for three-year-old colts and geldings is one of four stakes races on Pinnacle’s schedule to be decreased from $50,000 to $20,000 to cover the cost of operations for the Office of Racing Commissioner. The Dowling also marks the return of 2008 Michigan Two-Year-Old of the Year Mr. Conclusive from an extended hiatus. Mr. Conclusive was undefeated in four starts in his juvenile campaign, winning all three of Pinnacle’s two-year-old male stakes races by a combined 17 1/4 lengths. His most recent victory was a 2 1/4 length romp in last year’s Michigan Futurity at the Detroit-area racetrack. The Elusive Hour colt is owned by Charlie Williams and trained by Sandra Adkins. He will have the services of Thistledown rider Jane Magrell on Saturday. The Robert Gorham/Henry Mast connection will send three entries to post, highlighted by Lansing Stakes winner Juggle. The Elusive Hour colt outlasted stablemate Meadow Wise to take the Lansing by a nose on June 13. He enters the Dowling off a seventh-place finish against older company in the July 4 Wolverine Stakes. Juggle will be ridden by Jeffrey Skerrett. Also entered is another part of the Gorham/Mast three-horse entry, Meadow Wise. The Meadow Prayer gelding rallied late, but missed by a nose to Juggle in the Lansing. 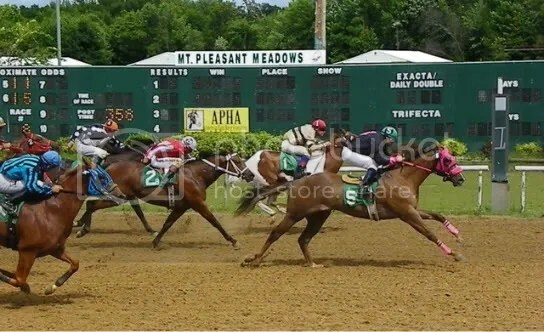 Despite an active stakes campaign at two and three, Meadow Wise enters the race off his maiden victory, a 1 1/2 length driving win against Maiden Special Weight company on July 4 at Pinnacle. Angel Stanley will ride Meadow Wise in the Dowling. Dials Corona For Me will seek her second straight stakes victory at Mount Pleasant Meadows this Sunday. After a driving win in her first stakes race, Dials Corona for Me will look to add some more blacktype to her resume in Sunday’s $36,483 GLQHA Stallion Service Sale Futurity at Mount Pleasant Meadows. The two-year-old Corona for Me filly enters the 350 yard race for juveniles as the field’s lone stakes winner. She accomplished that feat in the June 14 Michigan Bred Futurity at Mount Pleasant, winning the race by a half length. Owned and trained by Anthony Cunningham, Dials Corona For Me enters the race off a second place finish in the July 12 trials. She will be ridden by Oscar Delgado. After turning in the fastest time of the four trials, I Do One Two Three is part of the two-horse entry set as the morning line favorite. The Judy’s Lineage paint gelding finished a half length ahead of Dials Corona for Me to stop the clocks at :17.87 seconds in the 350-yard race. The trial was the horse’s first race at Mount Pleasant following three starts at Retama Park. I Do One Two Three is owned by T Bill Stables and trained by Jay Hall. Julie Veltman will be in the irons for the final. Also entered is Ron Raper charge Happenedindamoonlite. Owned by Jack Geer, the Jewels First Moon gelding finished second in the Michigan Bred Futurity. Happenedindamoonlite was a two-length winner in his trial, finishing the race with a time of :18.07 seconds. Regular rider Harold Collins retains the mount.